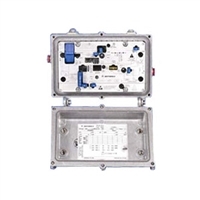 The BDA Broadband Telecommunications Drop Amplifier is a two-way 1 GHz amplifier designed for customer premise amplification. These amplifiers can be used to compensate for long drops and excessive splitting losses. 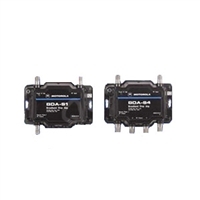 Each BDA is housed within a robust aluminum die cast housing and utilizes Motorola’s P-Series Auto-Seize F-Connector for maximum reliability. Motorola’s STARLINE® series line extender, model BLE*/*, leads the industry in features and performance and is designed to meet the needs of today's expanding broadband communication networks. This two-way capable single output amplifier offers high gain, high output levels, ergonomics, superior distortion performance, five diplex filter options, 16 dB return loss, and Bode equalization. The BLE*/* also allows optional advanced features such as ingress control switching and status monitoring. 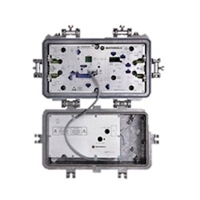 Motorola’s STARLINE® Broadband Telecommunications Amplifier, model BT*/*, leads the industry in features and performance and is designed to meet the needs of today's expanding broadband communication networks. This quad, power-doubled output amplifier features 40 dB operational gain, up to 870 MHz expanded bandwidth, 110 analog channel capability and Bode equalization in a three-stage hybrid design. The high operational gain of the BT*/* permits the amplifier to be strategically placed within the system topology for distributing broadband telecommunications signals. Motorola’s STARLINE® MiniBridger, model MB*/*, leads the industry in features and performance and is designed to meet the needs of today's expanding broadband communication networks. This dual, power-doubled output amplifier features 40 dB operational gain, up to 870 MHz expanded bandwidth, 110 channel capability and Bode equalization in a three-stage hybrid design. 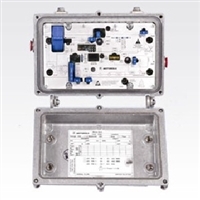 The high gain of the MiniBridger permits the amplifier to be strategically placed within the system topology for distributing broadband telecommunications signals. Single output versions are also available. 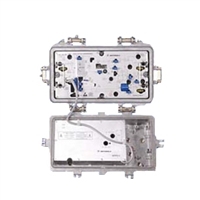 Motorola’s 1 GHz STARLINE® series amplifier, model MB100*/*, leads the industry in features and performance and is designed to meet the needs of today's expanding broadband communication networks. This two-way capable dual output amplifier offers high gain, high output levels, ergonomics, superior distortion performance, several diplex filter options, 16 dB return loss, and Bode equalization. The MB100*/* also allows optional advanced features such as ingress control switching and status monitoring. A third output is user-configurable via splitter or directional coupler plug-in. Single output models are also available. 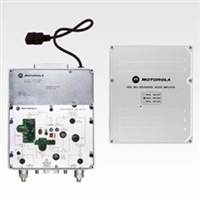 The Motorola BHA-100* Broadband House Amplifier is designed for HFC network installations in apartment buildings, condominiums, and any multiple-dwelling housing units. This high-gain indoor distribution aplifier is available with a bandwidth of up to 1003 Mhz, and includes a power-doubled output amplitication stage for improved system performance. The Single-output amplifier features variable gain and slope controls, as well as attenuator and equalizer facilities for greater flexibility when adjusting the amplifier. Both input and output ports are standard 5/8-24 entry ports for added flexibility. The BHA-100* ships standard with built-in diplex filters at its input and output. It includes an active return path for use in today's advanced networks. Motorola’s 1 GHz STARLINE® Series Broadband Line Extender, model BLE100*, leads the industry in features and performance and is designed to meet the needs of today's expanding broadband communication networks. This two-way capable single output amplifier offers high gain, high output levels, ergonomics, superior distortion performance, multiple diplex filter options, 16 dB return loss, and Bode equalization. The BLE100 also allows optional advanced features such as ingress control switching and status monitoring. 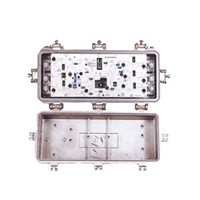 The Motorola 1 GHz STARLINE® Mini-Bridger® series amplifier, model MBV3, is designed to meet the needs of today's expanding broadband communication networks. The MBV3 is a two-way capable, triple-output amplifier that offers high gain, three balanced high output levels, ergonomics, superior distortion performance, multiple diplex filter options, 16 dB return loss and Bode equalization. The MBV3 also allows optional advanced features such as ingress control switching and status monitoring. It can be used as a direct replacement for the MBE87 amplifier with proper attenuation to create a trunk output.